Chromatography is a selective physical method to separate compounds in solution, that is used in many different fields of science. In the case of Soil Chromatography, the result is a ‘photo’ of the soil which gives us useful information about soil quality. Soil chromatography is a technique to assess the quality of the soil, which is easy to replicate and understand by farmers. 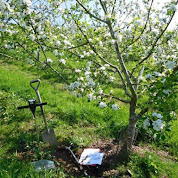 Chromatography can be used at the same time with other soil analysis (mineral, organic matter or biological test) with the objective to integrate several results, gathering a high level of understanding of soil in our farm, plot or backyard. Chromatography can be used to assess the quality of compost, biofertilisers, amendments, fruit, vegetables, seeds, plant tissues and other applications. Chromatography understands the soil as a being alive, in other words it is an unfinished process with elements working and living in symbiosis. Therefore the final result is a qualitative view of these processes and elements rather than a quantative one. Chromatography gives you valuable information such as soil structure, general health of soil, minerals available for the plant, biological diversity, or organic matter content and humus available. It also assess the fertility of the soil through the integration of previous elements.